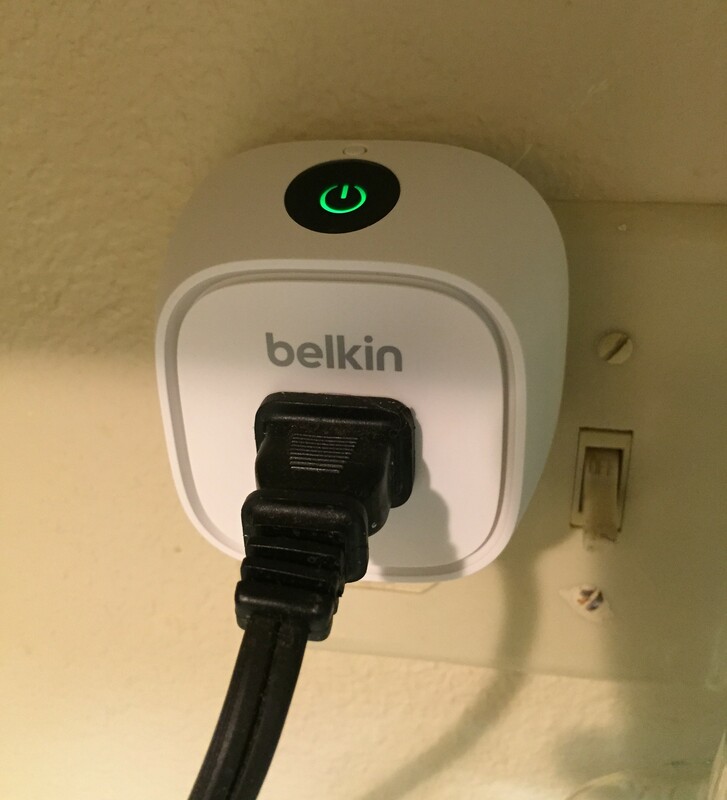 The Belkin WeMo Insight Switch is a smart plug that gives you remote control over your plugged-in electronics, easy energy usage monitoring and scheduling via the app, and compatibility with home automation hubs such as Amazon Echo. Basically, you can keep an eye on whatever is plugged into it from anywhere – and turn it off from anywhere, too! A little plug with a big brain! The WeMo lets you spy on energy usage and control your appliances from afar. 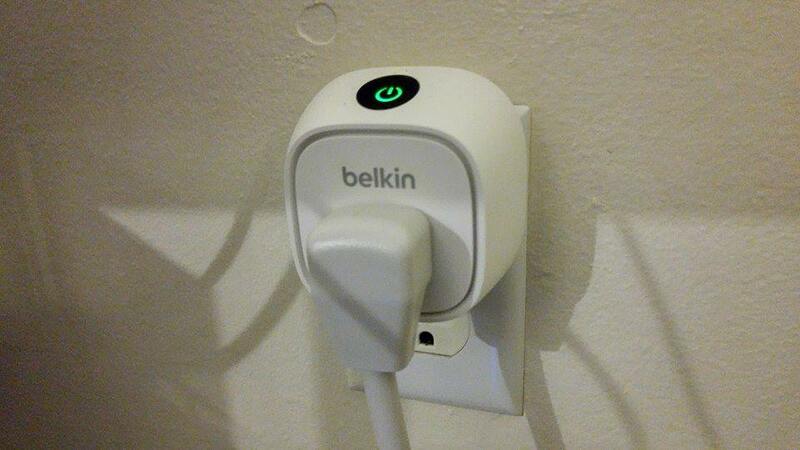 We think the Belkin WeMo is a smart little device and award it 4 stars out of 5. At first glance the WeMo seemed like just a novelty: a fancy way to turn something on or off when you’re too lazy to get off the sofa. However, after a couple weeks with it, we wanted more! Many lights around our house are on old-school pin-based timers, so the WeMo felt like a step up with its day-by-day scheduling, remote control app, and built-in energy monitoring. The WeMo traveled all over the house for the first couple weeks we had it, tracking energy usage for a variety of appliances. To earn that last star, we would want to more nuanced control over scheduling, a slimmer body design, and a way to turn off the WiFi indicator light (it’s really bright!). 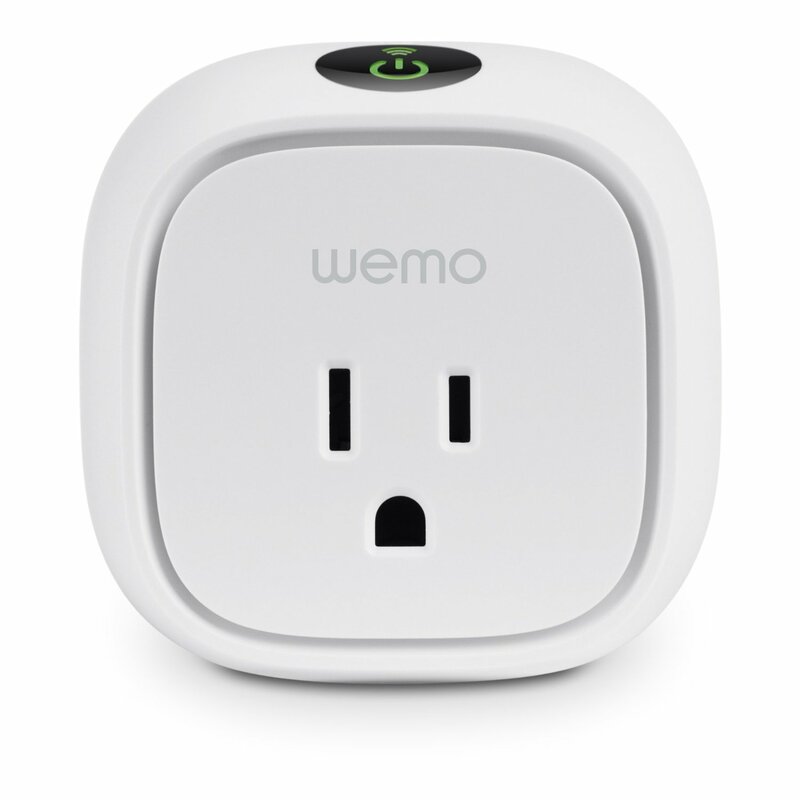 Setting up the WeMo was straightforward – plug it into an outlet, download the app on your smartphone or tablet, and then follow the instructions in the app. In setup mode (the app will guide you), WeMo makes its own local WiFi network which you connect to via your smartphone, which you then use to give WeMo access to your home’s WiFi network. The app is available for both Android (Google Play) and iOS (iTunes). The reviews are atrocious, but I’m not sure why – my friend is on Android, I’m on iOS, and neither of us had any trouble accessing the WeMo via our apps. Granted, we didn’t try to set up sophisticated schedules with multiple different kinds of WeMo family devices, but for controlling the smart outlet the app was just fine. Above: the WeMo tracked how long my bedroom’s box fan ran overnight and made an estimate of its monthly cost to run based on my own entered utility costs. 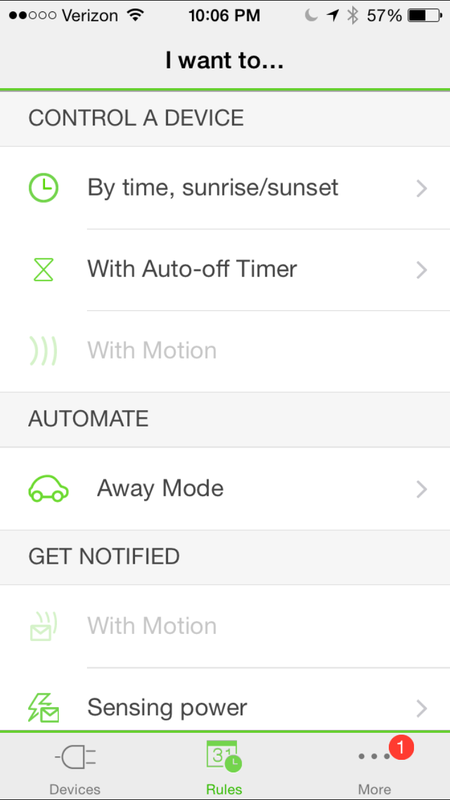 The app’s first screen contains a list of all of your WeMo devices. 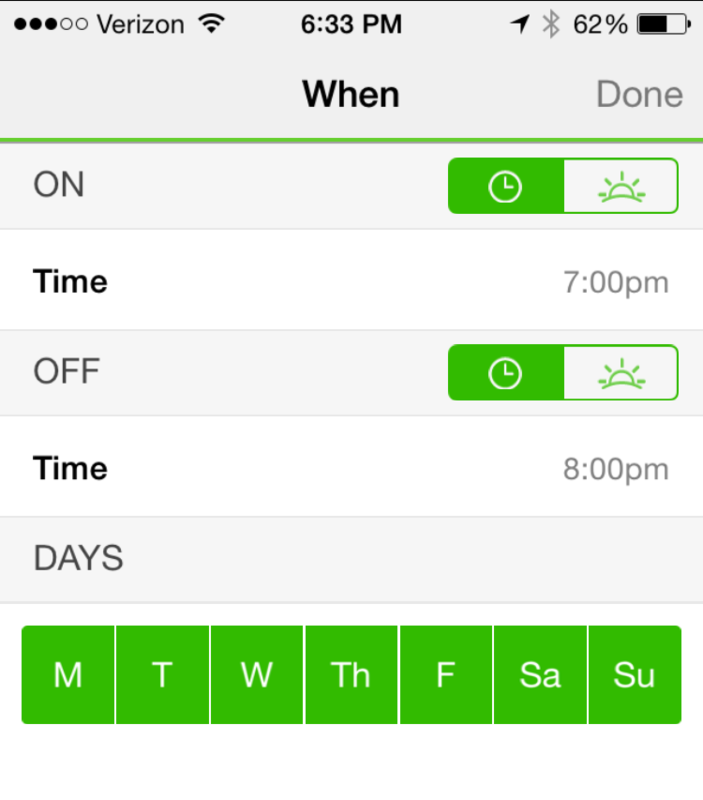 Tap a device to drill into its details: on/off status (tap the power icon to toggle it! ), up time (how long the device plugged into it has been running), an estimated monthly cost for running this appliance, and average watt usage. Tapping the power button to turn the plugged-in thing on/off really does work, but there’s a slight (maybe ~6 second) delay while the request gets relayed through your home’s network. If you’re used to putting lamps on pin timers, the WeMo is going to feel like a big step up. 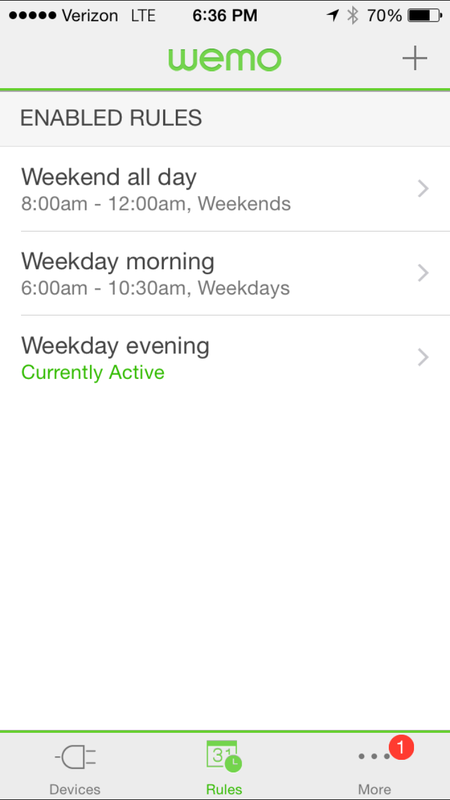 Each “rule” you add lets you add one “ON” and one “OFF” event and set the days the rule applies to. To make a sophisticated schedule, you’ll need to add several rules. Lights on in the morning, evening, and all day on the weekend. Sweet! You can even customize rules by days of the week! 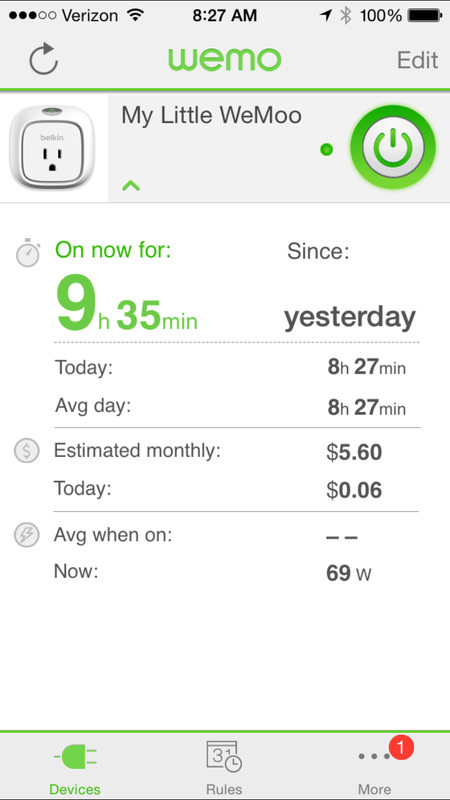 Energy monitoring was my favorite part of playing with the WeMo! It’s fun to plug various appliances into the WeMo and see how much energy they eat up. Use a recent energy bill to get your $ per kilowatt hour and plug it into the app for more accurate cost prediction. My refrigerator constitutes a whopping 1/4th of my power bill! Note: WeMo takes a good 1-2 minutes to get itself up and running and on your WiFi network after you plug it in somewhere new. During that connection time, you can’t turn on whatever’s plugged into it. The connection time is just long enough that, at first, I thought the WeMo wasn’t connecting – it was, there’s just not any visual feedback to tell you it’s “connecting”. So, if it looks like it’s not doing anything, give it a few minutes and it should eventually get on the network. The WeMo Insight Switch belongs to a collection of smart home switches, plugs, and lightbulbs by Belkin. From the WeMo app itself, or via a home automation hub like the Amazon Echo (note: not all WeMo devices are compatible with Echo yet), you can set up sophisticated routines for your home’s appliances. Imagine coming home to a well-lit, cozy home after work, thanks to all your smart devices working together! The WeMo family makes it easy to automate many lighting and power-related routines in your smart home. Alas, only some WeMo devices are compatible with Amazon Echo and IFTTT, but as home automation’s popularity continues to grow, we think we’ll see increased compatibility soon. The WeMo Insight Switch is a fun toy with a surprising amount of practical uses. Hook it up to that thing you’re always worried you forgot to turn off before leaving home, program it to turn your lamps on as the sun sets (even if you aren’t home yet), or plug it in behind your fridge and find out just how much keeping those leftovers cool is costing you every month.